The American Sign Language Club at SUNY Oswego aims to build awareness of deaf culture and the beauty of the language through ASL storyteller Dack Virnig's performance next month on campus. 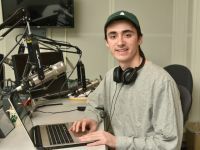 Virnig, who has nearly half a million views for one of the first of his many YouTube videos, "Mountain Dew Man," will share his stories and personal experiences at 7:30 p.m. Monday, April 1, in Marano Campus Center auditorium. His appearance is free and open to the public. "He's very cool. It will be a lot of fun," said SUNY Oswego senior adolescence education and physics major Kyle Bautista, president of the ASL Club. "Laura Latray-Corey inspired his visit." Latray-Corey, who teaches American Sign Language at the college and is the club's advisor, "came across 'Mountain Dew Man' on YouTube and suggested him," Bautista said. "I immediately contacted his manager and got the ball rolling." In a flip of the traditional script, interpreters of American Sign Language will be on hand for the benefit of those in the audience who can hear but don't know ASL. Bautista believes the evening will be special for everyone who attends, because Virnig puts heart, soul, hands, face and body into his tales. "He's a very passionate ASL signer," said Bautista. "His body language, his facial expressions … The face is almost as important as the hands. Facial features can determine meaning." Bautista, who is student teaching this semester in Red Creek, said he became interested in ASL when his older sister studied it while Bautista was in high school. He took two ASL courses from Latray-Corey at SUNY Oswego to satisfy a language requirement. "I found it very interesting -- a language without words," he said. "I've always been a very kinesthetic learner." Kinesthesia is awareness of position and movement of the body. Bautista, from Poughkeepsie, decided to get involved as a freshman in the then-new ASL Club at Oswego, and served as vice president before his election to the top office. ASL Club attendance at biweekly meetings varies, but can reach 25 to 30, he said. New members begin learning about the language with signs for letters and numbers. "Hopefully, by the end, our members can speak in sentences and carry on a conversation in ASL," he said. The club, one of more than 200 student clubs and organizations at SUNY Oswego, has made trips to the National Technical Institute for the Deaf at Rochester Institute of Technology, where members once saw a full theatrical performance of "Beauty and the Beast." Bautista said he intends to keep studying ASL after graduation in May, through community colleges and schools for the deaf. He practices the language on Skype with his girlfriend, who also has learned ASL and works at SUNY Purchase. Born and raised in Minnesota, Dack Virnig is fourth-generation deaf in his family. While growing up, he attended Minnesota State Academy for the Deaf and later California School for the Deaf at Fremont. He graduated from RIT in 2011 and founded DackCube Entertainment, an outgrowth of his YouTube fan base, "to inspire the world with how awesome and beautiful ASL can be," according to his website. Virnig's appearance -- the first two rows in the auditorium will be reserved for the deaf and hearing impaired -- is made possible by the support of the Student Association, the School of Education and its department of curriculum and instruction, and Auxiliary Services at SUNY Oswego, Bautista said.